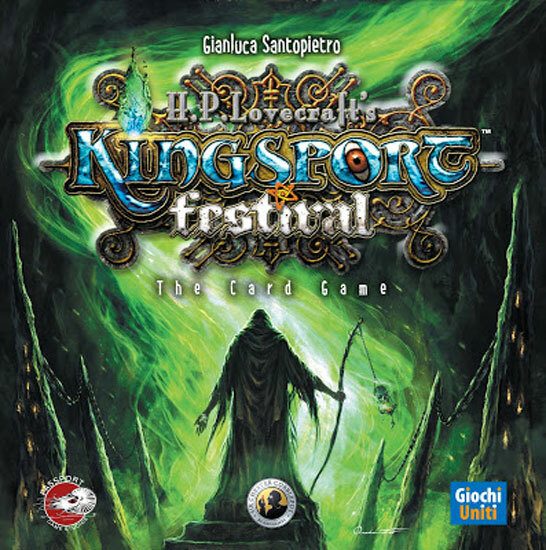 We review Kingsport Festival: The Card Game, a new game from Passport Games Studios. In Kingsport Festival: The Card Game, players must manage their hand of cards... and their sanity, if they hope to win. The idea of taking a successful board game and creating a variation on it is nothing new. However, spin-off games can be really hit or miss. Many times they end up being a watered down version of the base game that can’t really stand on its own (Nations: The Dice Game). However, occasionally you get that rare gem that actually surpasses the original game (Roll Through the Galaxy). Today we are going to be taking a look at Kingsport Festival: The Card Game. Kingsport Festival was a dice rolling, worker placement(ish) type game that has players invoking elder gods. This new card game seeks to capture the essence of the original title, but in a quicker and more streamlined play time. Let’s find out if it succeeds. Kingsport Festival: The Card Game is a dice rolling and hand management card game for 3-5 players that takes about 45 minutes to play. Kingsport Festival: The Card Game works well at all player counts. In addition to fighting off those pesky investigators, players must also manage their sanity, which is a resource used to power many of the elder god cards. The player with the most cult points at the end of the game wins! Kingsport Festival: The Card Game comes with a nice set of custom dice. The main components in Kingsport Festival: The Card Game are the two stacks of cards. There is a set of elder god cards, each featuring some great Lovecraftian artwork. Elder gods have a cost to invoke (recruit), a benefit it gives the player, and possibly some cult points (victory points). 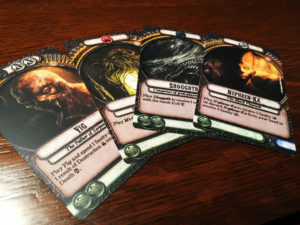 The investigators stack features a variety of investigators that not only will alter the game play slightly, but also attack the players 3 times during the game. All the cards are a tarot sized and high quality. The game also comes with a handful of custom dice: 5 domain dice, sanity tracking dice for the players, and a timer die. The 6-sided domain dice have uneven sides with 3 death, 2 evil and 1 destruction side. Finally the rulebook, which also ended up being the weak point of the components. The rulebook suffers from two issues. One, it’s not completely clear how to play the game. I had a bit of difficulty understanding the round structure and had to hop online for clarification. Second, it offers from some poor font choices. Many of the rules are written in an old style script font. While that’s a thematic choice, it can be really hard to read at times. When it comes to a rulebook, legibility is always more important than a thematic look. 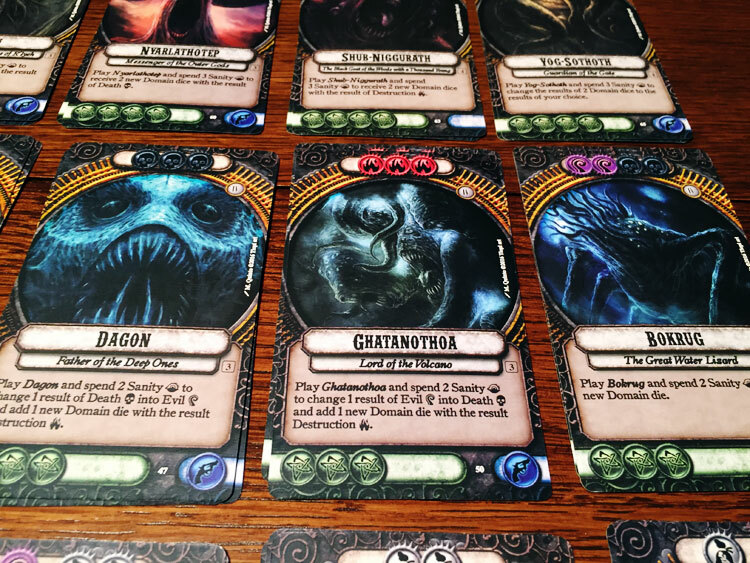 The elder god cards are laid out on the table in a series of rows, with an amount of cards determined by the player count. One investigator card is then randomly selected to use during the game. Expansion: Roll one grey domain die. You may then play any number of cards from your hand and use their effects (roll extra dice, change dice results, etc…). Invocation: You may spend the results of your expansion rolls to invoke (purchase) one elder god card from the center tableau. Raid: If this is a raid round, as indicated by the investigator card, each cultist must play elder god cards from their hand with enough gun symbols to fight off the investigator. If a player doesn’t have enough symbols, they lose sanity equal to the difference. End of Round: Once all players have finished steps 1-3, each player picks their cards back up into their hand and the time die is passed clockwise. The player who passes the time die gains 1 sanity as a reward. The game ends at the end of the 9th round, or earlier if someone invokes the Azathoth card. 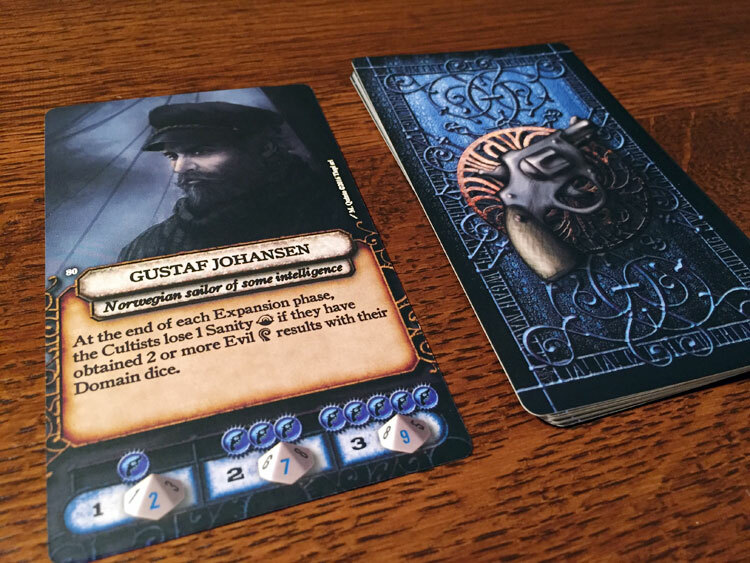 Players then count up the elder signs on their god cards, the player with the most is the winner. The cost to purchase a card is on top, the victory points are on the bottom with the gun icons. While I can appreciate designer Gianluca Santopietro’s attempt at creating a streamlined version of Kingsport Festival, his card game version has a number of hits and misses. The main issue I have with Kingsport Festival: The Card Game is that it’s pretty much on rails for the first half of the game. 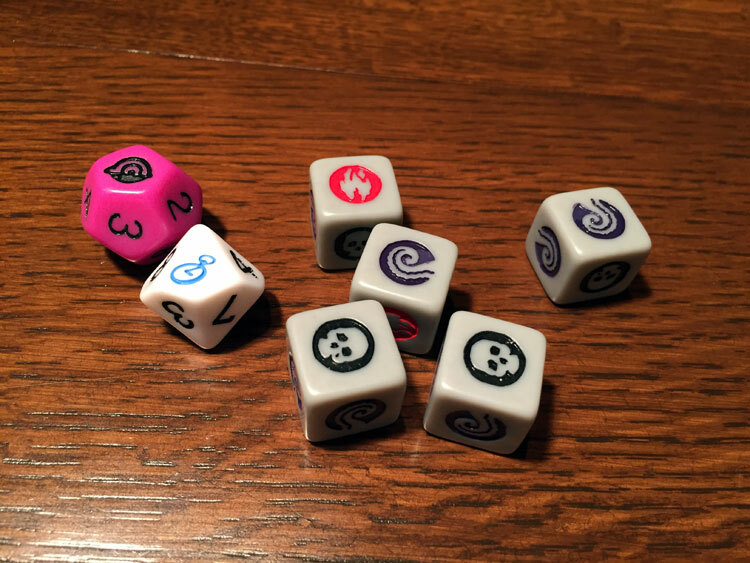 You start out round one by rolling one die… and that’s it. You will only have a choice between two cards in the first round, depending on the die roll. Things will start to get better after that, but until you have a nice hand of 4-5 cards, you are pretty much going to be buying whatever you can afford each round. You can play every card in your hand each round, and you will get them all back at the end of the round. And that’s where Kingsport Festival: The Card Game struggles. The early game just isn’t that exciting. You’ll roll the dice, play all of your cards, and buy the best card you are able to afford. Maybe adding some press your luck re-rolling could have helped. However, once you get into rounds 7+, the game does start to get interesting. Then, you will have a hand full of cards and can really start to make some meaningful decisions. This is because many of the cards require spending sanity to play. So you have to not only manage your hand of cards, but make sure you don’t go insane too. The down side of that is that once things do start to get interesting, the game is almost over. 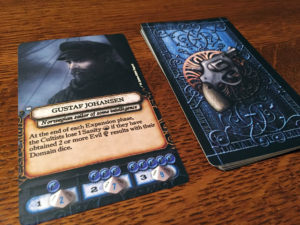 I did enjoy the way the investigators ability will change-up how the game is played ever so slightly. Some will make the game much harder, while others will actually make it easier. Yet I almost wish there was some kind of guide for the investigators that let players decide if they wanted to use one that made the game easier or harder. With a random draw, it’s basically a crap shoot as to what you’ll get. I also really liked the hand management aspect of the game. In Kingsport Festival: The Card Game, there is no draw deck. You get to use your entire hand of cards every round. This mechanic helps to give the players a good amount of choices during the expansion phase, especially in the later rounds. As the game already has randomness with the dice rolls, I’m glad they didn’t decide to add in card draws as well. Each game will feature one random investigator there to hassle the cultists. Finally, let’s talk about player scaling. While Kingsport Festival: The Card Game plays well at each of its player counts, I found it odd that the game starts at a 3 player minimum. For the life of me, I couldn’t figure out any reason why this game needs at least 3 players. For some games, a 3p minimum makes sense (area control games), but not with Kingsport Festival: The Card Game, unless I’m really missing something. We actually tested out Kingsport Festival: The Card Game with only two of us by removing one card from each stack except the ones with only 1 card, and it played just fine. Maybe someone else can enlighten me on what I’m missing. I feel like Kingsport Festival: The Card Game had the potential to be a great game, but it’s defiantly being held back by the early game. There just aren’t enough meaningful decisions to make until round 5-6 at the very least, and at that point, the game is almost over. However, once you learn the rules, the game does play quickly and can be a good time. I should point out that the game is a bit of a table hog, so despite it’s small size, it’s not that great for on the go. Kingsport Festival: The Card Game is a solid hand management game that’s definitely on the lighter side, which helps to make it an accessible game. It also boasts a pretty low price point, which makes it a more enticing impulse buy. If you’d like to pick up a copy of Kingsport Festival: The Card Game, you can get it for about $20. Final Score: 2.5 Stars – While this card version of Kingsport Festival does some good things, it’s ultimately held back by the lack of decisions for a good portion of the game.